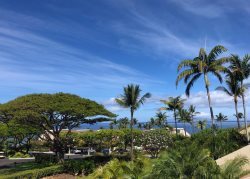 It's an easy 30 minute drive from the airport to Kihei, Maui. DIRECTIONS: From the airport, exit on Keolani Road. Go STRAIGHT through the traffic light at the Costco- (Keolani becomes Dairy Road, HI-380, here) Continue along Dairy Road(HI-380) for 0.8 miles, then turn LEFT onto PUUNENE AVE. PUUNENE AVE becomes MOKULELE HWY / HI-311 - continue for 5.8 miles, then turn/veer LEFT onto PIILANI HWY / HI-31. Continue on Piilani Hwy/31 for 5.4 miles, then turn RIGHT onto KEONEKAI ROAD and follow it down to S. KIHEI RD. Most of our units are located within 1/2 mile of this location.